Romance. Romance. Romance. Repeated romance. 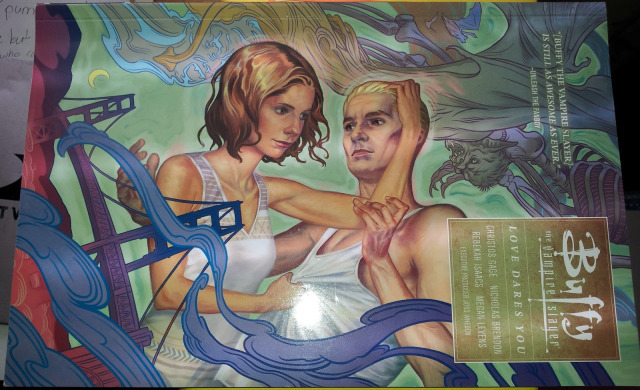 That is–though nowhere near wholly true–what Buffy, the Vampire Slayer Season 10 Volume 3 contains. Just glancing at the cover art above, you can guess who all couples this volume's romance. So, yes. That’s Buffy and Spike getting back together. A touch, touch-touch old and echo-ish from their blossoming (and tumultuous) relationship from the TV show. I would even stretch to tag it as (fan?) service for those die-hard aggressives who ‘ship the two. The only reason I wouldn’t is because of the characters’ history. So it only seemed appropriate these two finally just… well… committed! It’s the current situation, and unfolded in classic Buffy on psychological-trekking psychedelics style. Obviously that’s the selling point/highlight of this volume. Only, that’s not all the bustling romance. Xander of Dawn’s relationship comes to another tier or resolution. The ghost of Xander’s former, Anya, continues to make her “psychoanalysis” appearance via Xander’s consciousness. So that web of character commentary and growth comes together leaking from the show. The same goes for Willow’s lighter situation with a demi-god. Andrew continues to come to terms with his sexuality–I think. Something about him seems back-and-forth. Didn’t he recognize he was gay before? Or maybe that’s just us watchers/readers picking up the signals. Aside–but not-so aside–the romance comes the reemergence of Olivia's character. A character in which I want more from. And has since she appeared on the TV show. As a woman of color, I ask the writers move her into the inner circle pronto! As it goes for Season 10's story arc, Buffy and the gang are still working out their issues with writing the rules of magic. Despite the arc's motion taking a slight backseat in this volume, it’s still present and carrying the characters' motives. To me, I still find season ten's arc contained and undeviating. Unlike a few aggravating moments in seasons past where the writers threw chum buckets filled with plot threads out to sea (see what I did there?). No ma'am. Season 10 still makes sense! Thank God these guys got a grip on its reins. Nonetheless, adjacent to Buffy and friends' quest comes a new super bad seeking the rights to magic. Along with another demon connected to vampires in a way I refuse to give up as a spoiler. Buffy Season 10 still f'ing ROCKS! Demons. Gore. Comedy. Character. And romance. God bless the child.